← Take a break with light and crunchy almond bars. Mushroom madness has hit my house. Well, maybe not the whole house since I am the only one who will eat them… At least, in a few cases the only one who knows they are eating them. Ha! I have been known to sneak them into dishes without telling Dear Hubby and Girly Girl. But before you starting thinking I am some kind of maniacal mushroom maniac, please settle down. It’s not like either one of them are allergic or anything like that. As far as my husband goes, mushrooms are right up there with mayo in the “things I will not eat” category. I have quizzed him about both several times, asking if either were part of some kind of frat hazing or wrongly implicated in a case of food poisoning (but more likely a virus as most people know, its just way more dramatic to say, “I’ve got food poisoning!”). But none of this kept me from purchasing my very own mushroom farm after it popped up on an email from the shopping site, Open Sky. Actually I saw a list of recommended products from one of my favorite chefs, Hugh Acheson, and this was on that list. 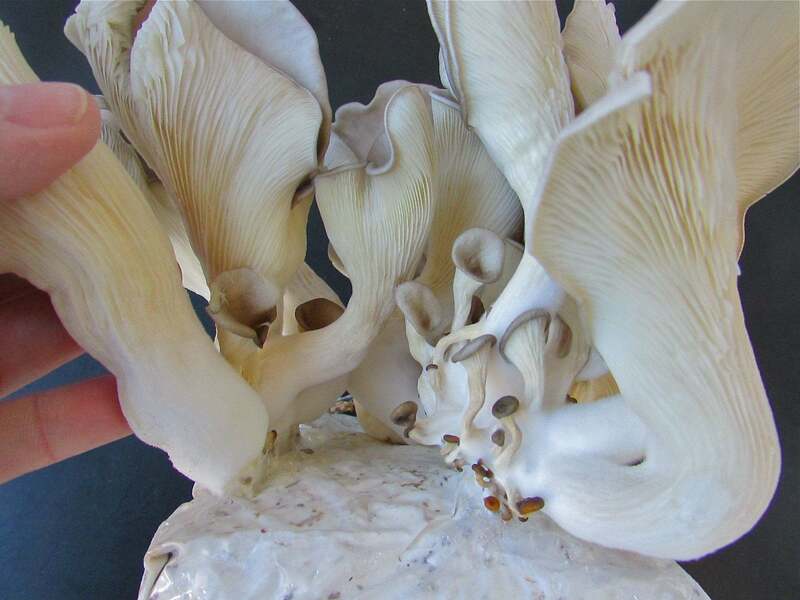 I had a credit also so I took a chance and here I am harvesting fresh oyster mushrooms a mere 3 weeks later. Thanks Hugh! This is a fun winter-time project in my locale as it is cool and dry enough to grow these in the perfect indoor conditions now. 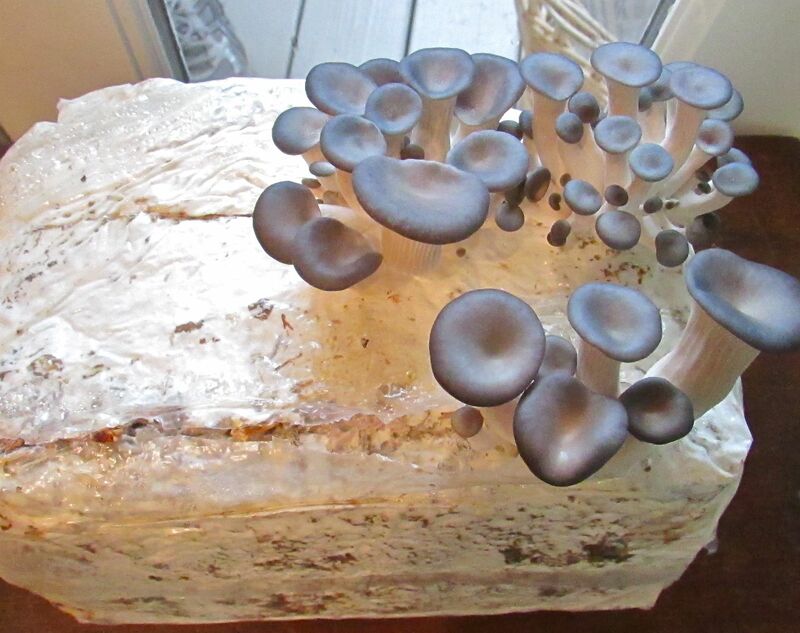 In a couple of months it will be humid and hot – perfect to grow mold but not great mushrooms. It took about a week or so for the first tiny ‘shrooms to appear. Once they popped up, it was go time. They grew very, very quickly – my husband is convinced he could see them growing before his eyes, so that was a tad freaky. My harvest was 4 days after they broke ground, although I could have taken them after the third day. But I had to time the harvest to coincide with making my favorite mushroom recipe – mushroom goat cheese toasts from the Mustards Grill Cookbook. Chef Cindy Pawlcyn created a wondrous restaurant called Mustards Grill in Napa, CA and having been lucky enough to dine there (a long time ago) I can attest to that. I am glad to know she and the restaurant are still going strong after almost 30 years. This recipe relies on fresh ingredients and simple techniques, perfect to showcase those awesome mushrooms. The box arrives! These were “born” in California. It is an easy set up. Remove the plastic wrapped block, slice it a couple of times with a sharp knife and sit the block in a cool spot that gets good indirect light. 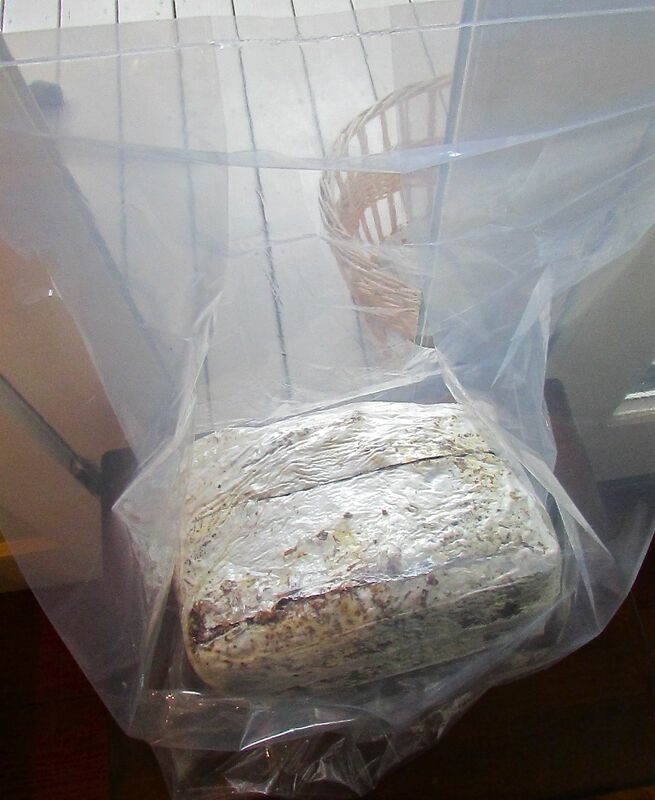 Loosely cover with the included plastic bag (that has slits cut in it). Every day spray the inside of the bag with a bit of water. We have lift off! In less than 24 hours these grew from tiny nodules to this size. Here they are after 4 day’s growth. Time to harvest! These are definitely ready to cut and make into something delicious. 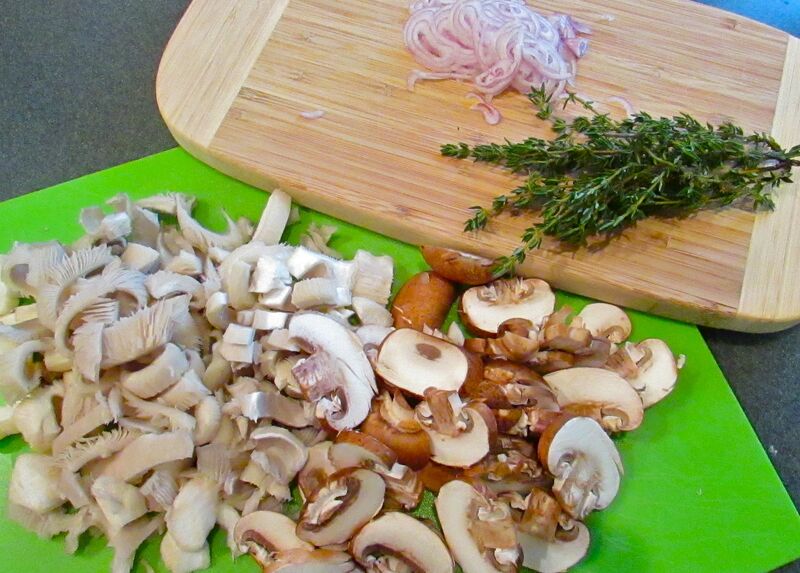 The prepared mushrooms – both the oyster mushrooms I grew and some purchased portobellos -Chef Pawlcyn uses morels but a combination of different mushrooms will work great. Saute the shallots in the oil and butter. 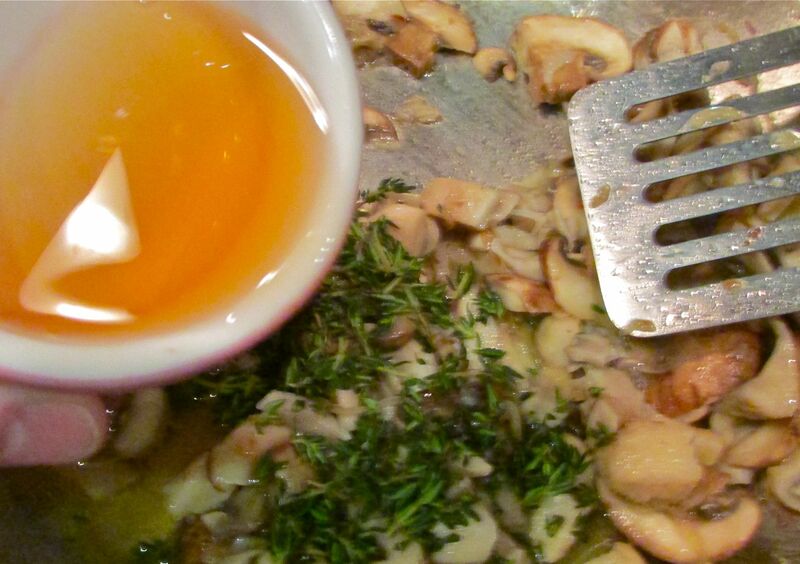 Add the Applejack (or Calvados or other suggested liquor) to the mushroom/shallot mixture. Toss in the thyme and season with salt and pepper. 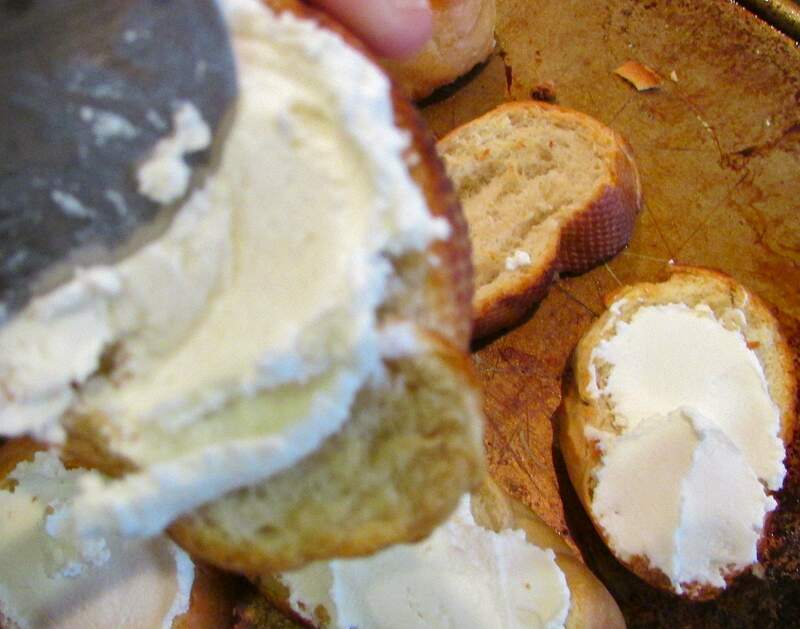 Mix the goat cheese and cream until smooth. 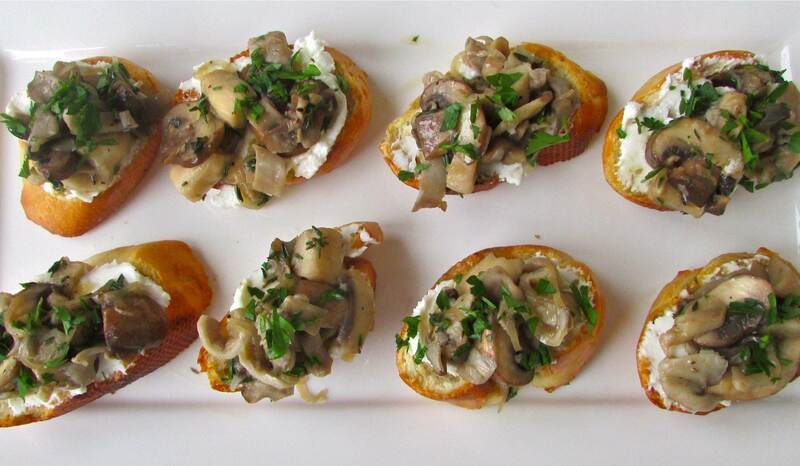 Put the toasts together – slather a good layer of the goat cheese on toasted French bread slices, top with the warm mushroom mixture and sprinkle with parsley. Here’s a shot of the ‘toasts’ – makes a nice app or first course, maybe for an Oscar party? Hungry yet? I am. 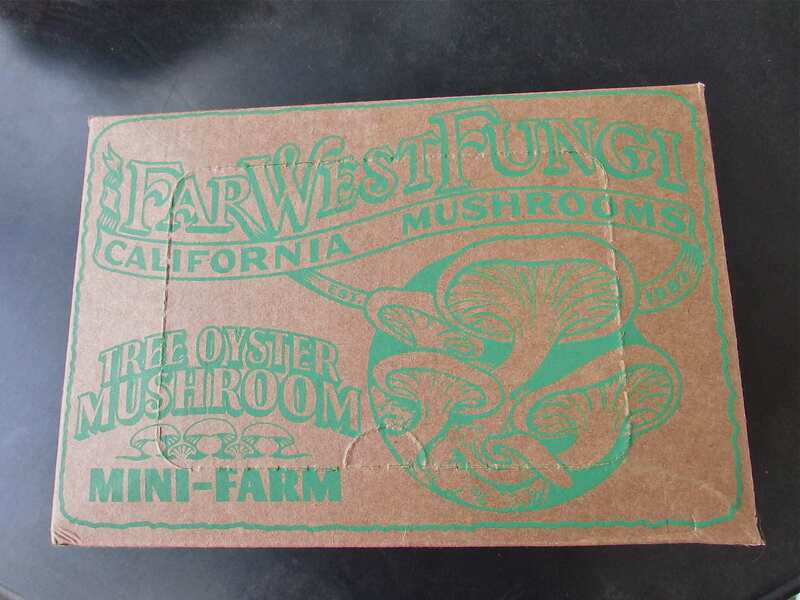 Here’s to a bountiful second harvest of oyster mushrooms! Heat the olive oil and 1 tbl butter in a sauce pan over medium heat. 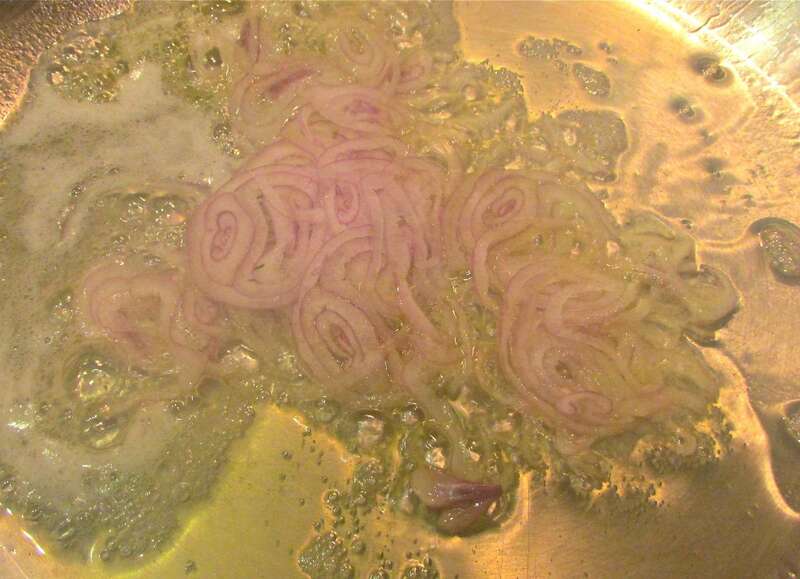 Sauté the shallots until transparent – about 2 minutes. Add the mushrooms and sauté another 5-7 minutes, stirring occasionally. Pour in the Calvados or Applejack and stir to combine. Sprinkle with the thyme and season with salt and pepper. Remove form heat and stir in 1 tbl butter. 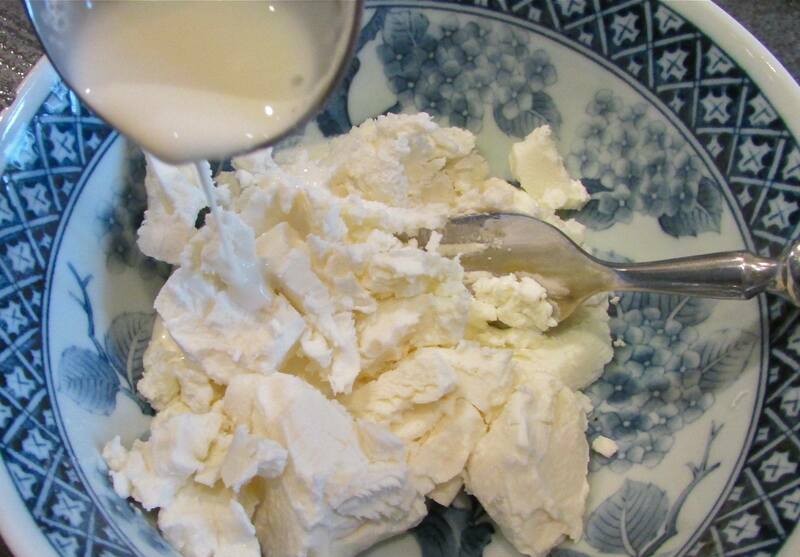 In a small bowl mix the goat cheese and cream until smooth. 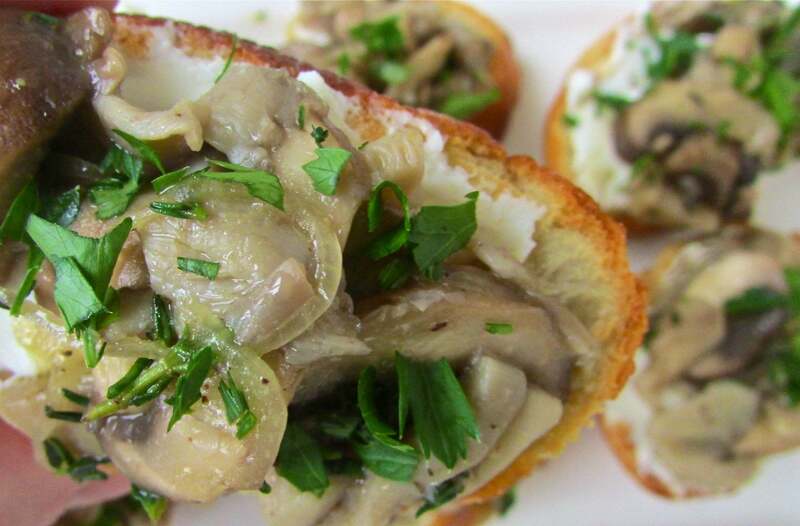 Spread each toast with a helping of goat cheese, top with warm mushroom mixture and sprinkle with parsley and serve at once. Note: Any leftover mushroom mixture makes a superlative omelet filling or burger topping too! 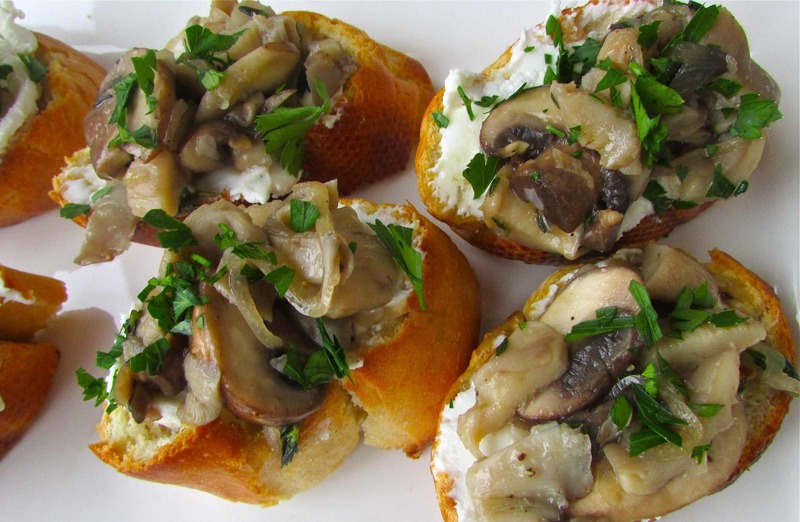 This entry was posted in Recipes and tagged appetizers, first course recipes, mushroom goat cheese toasts, mushroom recipes. Bookmark the permalink. Great Anne, this one of those recipes that has it all – taste, looks and is easy to make. Hope you try it! 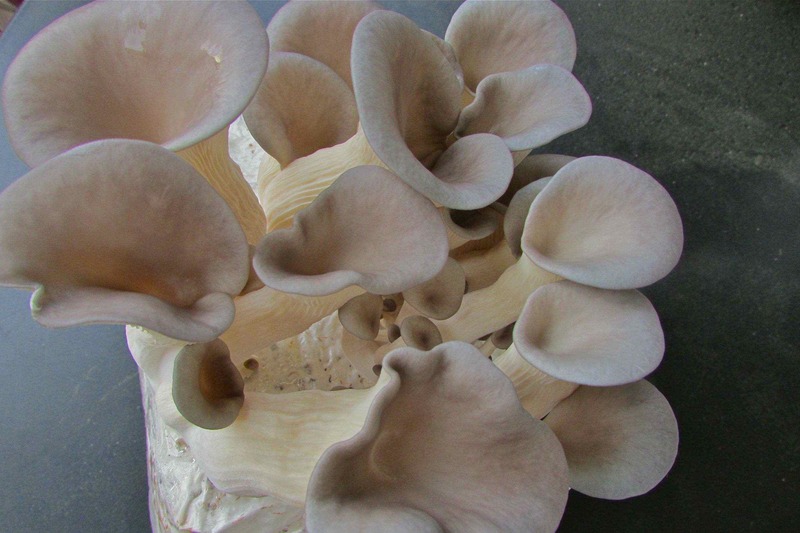 Oh I so glad you like Oyster mushrooms! Try to grow some too – they would make awesome photos. My husband said they looked just something from ‘Alice in Wonderland’.